Don't have a Cordia, but rather a Lancer EX with a G62B Turbo engine - same as Cordias. Appreciate any comments or advice, thanks! Try to find a spare fuel rail to modify. You will need to enlarge the injector holes a bit and take the filters out since the newer injectors have filters in the feed ends. You will also need some spacers to raise the fuel rail up with longer bolts. I think the connectors are the same. I'll be doing this mod to my Cordia soon. So it seems that they're both likely ~800cc each? 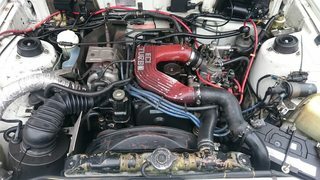 I think I read somewhere that the AB and AC Cordia have two different setups (1x large and 1x small injector, or 2x same size injectors), but I'm not sure which model years are the AC or AB, but my setup is likely to be similar, if not identical to the later model ones, or does only Starion have this setup? AA, AB 1983 to 1985 run the black top injectors (800cc), AC 1986 to 1988 run the grey tops (750cc), hope this helps.